You know you're in for an unusual night at the theater when the pre-show announcement asks you to turn off all cell phones and put aside your thumb screws, guillotines and firearms (which you are encouraged to use during intermission). All things creepy and kooky are on stage at The Shubert as "The Addams Family" brings to musical life the odd and infamous family created by cartoonist Charles Addams. Music and lyrics are by Andrew Lippa with a book from Marshall Brickman and Rick Elice. While many know Gomez, Morticia, Uncle Fester, Grandma, Wednesday, Pugsley and Lurch from either the popular 60s television series or the 1991 motion picture, the fact is that the quirky and ghoulish family originally reached the public via darkly humorous single cartoon panels in the pages of The New Yorker. The musical originally opened on Broadway in 2010 starring Nathan Lane and Bebe Neuwirth and playing more than 700 performances. The plot, which has been somewhat revised for its national tour, involves young Wednesday (Cortney Wolfson) finding love. Her intended is -- gasp! --an all-American kid (Brian Justin Crum). From Ohio! Gomez and company are justifiably horrified when they learn they must invite the boy's parents (Martin Vidnovic and Crista Moore) to dinner at their Gothic manse tucked into a corner of New York's Central Park. The plot is thin, but no matter. The evening is light and funny, allowing for lots of clever sight gags, puns and references. It also gives Boston audiences a chance to enjoy the talents of Broadway's Douglas Sills ("The Scarlet Pimpernel," "Little Shop of Horrors"), who delivers a delightful performance as the preening father and husband who's devoted to his wife and driven insane when she speaks French. The pivotal plot point is that Wednesday's plan to marry is a secret, which she shares with her father, who, in turn, has never kept a secret from his wife. Morticia knows something's up and holds it over his head until the beans are spilled. At which point, the family suffers a blow from which it may not recover. The show gets off to a lively start with "When You're An Addams" as everyone gathers in the cemetery to honor all those Addams who have gone before. One of the best spots in the show, the number is funny and inventive as the company quickly shifts dance styles on Gomez's comical cues. Although Uncle Fester (Blake Hammond) says "You're probably thinking, what could a fat, bald person of no specific sexuality know about love?," he believes nothing is as important as love. And so he insists all Addams souls of the past find a way to help make Wednesday's romance a reality. He also confesses he's in love with the moon, which later results in a very funny, though odd, musical number. Grandma (Pippa Pearthtree) is a drug-poltice-herb toting shrew in a fright wig -- although she does get in a nice zing about texting. 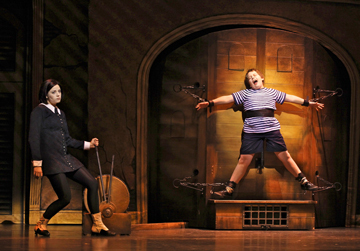 Pugsley (Patrick D. Kennedy) lives to be tortured by his sister (at left). And Lurch (Tom Corbeil) drags himself through the background while serving his masters. Corbeil also comes up with a surprise at show's end that proves to be a big hit with the audience. As Morticia, Sara Gettelfinger plays it much bigger than Carolyn Jones ever did on the TV series. She shows off her dancing skills in "Just Around The Corner," but I missed Jones' version of the tight-hipped, smoldering ice queen who could barely walk in her dress. And lest we forget some of the less verbal characters, Cousin It makes an appearance (greeted with a roar from the crowd) as does Thing during the very clever five-fingered opening of the show. As a touring production, much of the scenery has been reduced to painted drops. However, opulent, heavily-gathered blood red drapery is beautifully used to reveal location and focus attention. As well, the lighting design by Natasha Katz is tops. With so much potential, one only wishes that the excellent elements had a more solid foundation from which to soar. 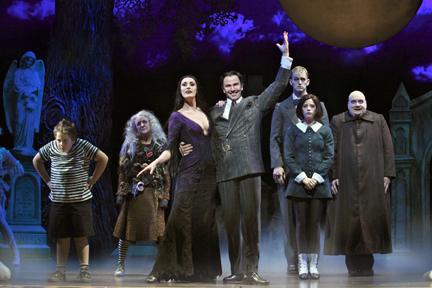 "The Addams Family" is at The Shubert Theatre through FEbruary 19. For information, call 1-866-348-9738.